In SQL Server 2016, one of the key management improvement is a new feature that is called Database Scoped Configurations. This improvement allows you to control a number of parameterisations of the SQL Server, based on the database level. The Database Scoped Configurations bring a different type of parameter control to our disposal – the one that controls the parameters of only one certain database, and I call it a horizontal control, in the sense, that like on the picture on the left we control the space marked with the red color. The option that we have had since SQL Server 2008 and significantly improved in later versions is a type that I call a vertical control – we have a certain group of users (default or manually configured) that we control, no matter which database they access on our server. You can see this on the image on the right of this text, with the magenta border marking the control border of the Resource Governor control area. Notice that the Resource Governor settings still overdride the controllable options we may define within Database Scoped Configurations (this applies to MAXDOP in the current version only), but let us not rush in the hurry and continue with the overview of the current scope of improvements. With every SQL Server version, Microsoft has enabled more and more different switches on the platform, allowing to combine different types of workloads within the same instance of the SQL Server. A lot of this improvements definitely have to do with the requirements and necessities of the Azure SQL Database, especially given the specifics of the Trace Flags usage (normally, you can’t enable them at all on Azure SQL Database), but those changes do matter a lot, given the possibility of mixing workloads and especially vendor applications that demand certain settings in less then compatible way with anything else. Another very important part of the database scoped configurations is that for the high availability installations where AlwaysOn Availability Groups are used, we can control the values on the primary as well as the on the secondary replicas, (with the exception of the Procedure Cache Cleaning which is available for the Primary Replica only). This means that we can set separate values for the primary replica where we write the data (let’s say its an OLTP System and we set MAXDOP = 1) and the secondary replicas where do the analytics (there we shall set up the MAXDOP = 8, for example). Looking at the current functionaries, it is easy to understand how far those improvements do extend – Procedure Cache cleaning (before 2016 you would need to use DBCC FREEROCCACHE), MAXDOP (previously controllable on the instance level through sys.sp_configure), Query Optimizer Cardinalitiy Estimation Model (previously Trace Flags 2312 & 9481), Parameter Sniffing control (previously Trace Flag 4136), Query Optimizer Hotfixes enabling (previously Trace Flags 2312 & 4199). 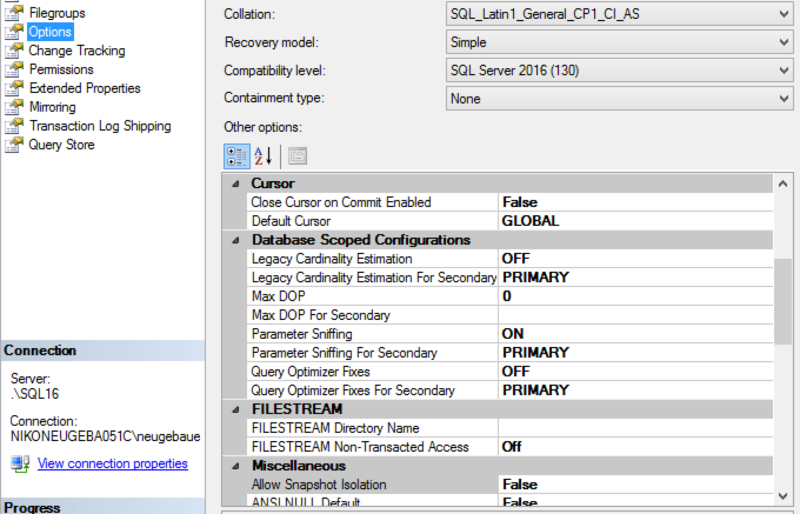 Notice that most of the mentioned trace flags were applyable on the instance level, making mixing of the database with the distinct needs impossible within the same SQL Server instance. Starting with SQL Server 2016 and the current Azure SQLDatabases we have an additional group of Database Scoped Configurations within the options tab for every single Database. At the picture on the left, you can see that we have a direct possibility to control the 4 of the 5 available options for the Database Scoped Configurations, and the most importantly – we can control them for both primary and secondary replicas. The only Database Scoped Configuration that is not to be found within SSMS GUI is the Procedure Cache cleaning – which makes a reasonable sense, because this is a command affecting the current memory status and it is not an option which has a number of different values. Do not worry about GUI, the most important is that you can control all Database Scoped Configurations through the principal weapon of choice for anyone working SQL Server: T-SQL. – ALTER DATABASE SCOPED CONFIGURATION: running this command within the context of a database will allow us to do modifications to the Database Scoped Configuration. Notice that clearing the procedure cache is only available for the primary replica. The other commands syntax can be found on the ALTER DATABASE SCOPED CONFIGURATION Documentation page. In Azure SQLDatabase and SQL Server 2016 we have now 4 distinct ways of controlling MAXDOP. – Query Setting (obeys to Resource Governor and overrides the Database Scoped Configuration). This happens because I have configured MAXDOP = 1 for the ContosoRetailDW Database Scoped Configuration in the previous steps. This shows that the Database Scoped Configuration are prevailing on the default queries, and on the single query level we can go beyond the configured values, as currently happens in the relation to the instance-wide setting. This result clearly shows that Resource Governor stays the responsible for the maximum values, while Database Scoped Configuration can allow to minimise them further, if needed. I absolutely love the direction that Microsoft took with this Database Scoped Configurations – it gives us very accessible ways (and some new ways as well – think of any secondary replica’s control right from the primary) to control a number of options that were accessible only through the trace flags (sysadmin or even system restart would be required), and even more importantly – we can exercise the horizontal control of the settings, on the specific database level. The possibility of mixing different workloads and applications on the same instance (Sharepoint, CRM, custom analytics and data marts for example), allowing us to consolidate more of the management, should there be a need for it. You have explain briefly. you just explained little part of the concept only. Thank you for the kind words, Maneesh! 1 more thing, dbcc flushprocindb and clear Procedure_cache serves the same purpose. indeed, but they have different scope of permissions and support to my understanding.